I like this post, particularly the musing about seasons. 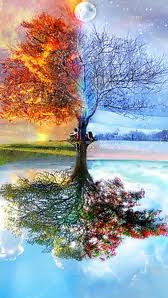 The boarders of seasons are somewhat arbitrary -- defined differently by astronomers and meteorologists. I think we may define divisions out of our human desire to know what to expect each day. For example, in weather we talk about "normal" temperatures for a given day; but "normal" comes from averaging temperatures over many years. So the "normal" high temp for Oct 14 in Washington, DC might be 72, but one year might be 85 and the next might be 59. Over the long-haul you still average out to 72 but you rarely actually see that temperature.